As of late I've really had a thing for statement necklaces. I love how a bold piece of jewelry can really pull together a look that would otherwise be boring. I recently found out about Marciva and I think I've found a site that not only has gorgeous high quality necklaces but has them at a decent price. Necklace 1 & Necklace 2: I love that these are bold, chunky, and have faux white rhinestones. They are very versatile and would go with everything in my wardrobe. I think they would look amazing layered together for a bold elegant look. Necklace 3: Gold and pearls are timeless. I think this necklace would add a vintage vibe to whatever I pair it with. I can see myself wearing this necklace with most of my thrifted pieces of clothing. Necklace 4: I'm leaning towards buying this necklace because it just looks like Spring to me. I love the pastel pink and orange gems and the teardrop design. Necklace 5: When looking through my necklaces I already own, I realized I don't own anything blue. I love the combination of both cobalt and baby blue in this necklace. The pop of yellow is also a fun touch, who doesn't love yellow? Necklace 6: This necklace is so boho-chic and would complete any bohemian look. I recently bought this gorgeous blue maxi dress and I could see myself wearing that, my saltwater sandals (in the Spring), a light weight cardigan belted, and this necklace. 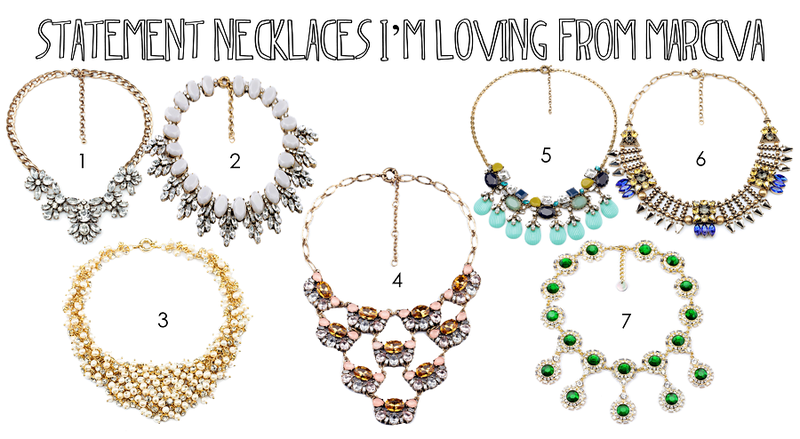 Which necklace is your favorite and which one(s) do you think I should get? Go with number one. You said it yourself you can wear the necklace with anything. I am of the opinion that if you can wear a piece on the runway or on a run to the corner store you should buy it!